After facing a tough competition from the Chinese brands especially from Xiaomi and Huawei Samsung launched "M" series Smartphone with attractive features under the budget range. 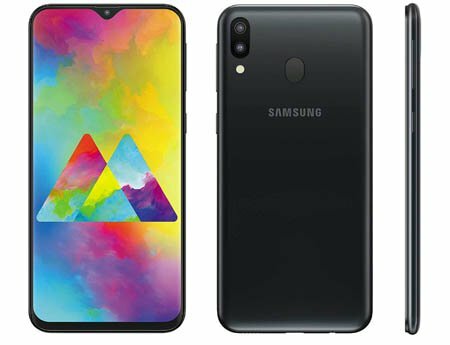 Samsung Galaxy M20 is value for money kind of smartphone featuring a large 6.3 inches display, Android 8.1 Oreo OS, 13+5 MP Dual primary camera, 8 MP secondary camera, Exynos 7904 Octa core processor, 32/64 GB internal | 256 GB External | 3/4 GB RAM and 5000 mAh battery. This handset comes with a stunning 6.3 inch infinity V display. Its near bezel-less edge to edge Full High Definition+ screen gives you an immersive viewing experience. Although it has PLS TFT display while we are expecting the AMOLED display. The volume rocker and power buttons are located on the right edge and left corner housing the card slot. Bottom has 3.5 mm jack and a speaker grille. With F1.9 aperture primary camera is capable of taking decent photos even in low light conditions and its live focus feature offers a great portrait shots, clicking group photos is fun from the Ultrawide Dual Rear Camera. 8 MP f2.0 Front Camera along with In-Display Flash captures the pleasant selfies in all seasons. This handset is powered by the Exynos 7904, 1.8 GHz Octa Core Processor which can smoothly handle multitask with gaming. The Galaxy M20 runs on a new superfast UX Samsung Experience v9.5 that is crafted for Experience of a smoother and faster UX, especially optimized for the Galaxy M Series. The Galaxy M20 also featuring biometric authentication which lets you easily unlock your phone with your face and fingerprint as well. You can also stream HD content with the help of Dolby ATMOS 360 degree surround sound that will definitely enhance your music experience. One of the best and notable feature of this smartphone is its massive 5000 mAh battery, that offer about 2 days battery backup for a typical user. There is also a 15W Type-C fast charger in the box that gives you 3X faster charging capability. A Large Full HD+ 6.3 inch infinity V display. 13+5 MP Dual Camera with Ultra Wide lens. 256 GB Dedicated Micro SD card slot. Offering biometric authentication by face and fingerprint. A massive 5000 mAh battery offering 2 days battery backup. Support Fast battery charging by 15W charger. Doesnt support 4K and slow-mo recording. Doesn't have LED flashlight for selfie. No IR blaster to control the TV and other home appliances. Because of massive battery the weight is relatively more i.e. 186 gram.